Gregory Marler had the great idea to implement an “explored” map, based on a concept that some of you might know as “fog of war” from strategy video games. 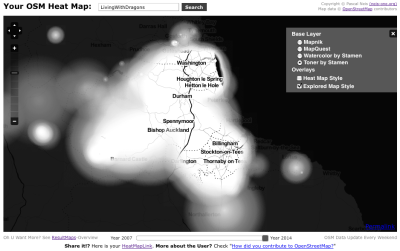 So here you go: I extended my OSM Heat Map with the “Explored Map Style”. It essentially reveals the contribution areas of an OpenStreetMap member in a “fog of war” style. 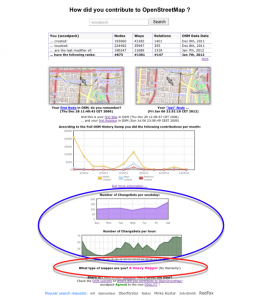 The following figure shows Gregory’s amazing “explored” OSM map. The OpenStreetMap (OSM) project celebrated its 10th anniversary in August 2014. For almost 10 years it has increased its number of registered members. Even though some contributors stopped their contributions to the project, each day new mappers start collecting features for the free wiki world map (aka database). In my last contributor report in 2013, the OSM project had a total of 1.3 Mio registered members. For July 2014 this number has increased to almost 1.6 Mio registered members. Similarly to last year, I checked how many contributors created one or more than ten changesets or performed more than 10 map edits. This information can be retrieved from the changeset dump. The figure above reveals a similar trend to the ones we saw in the past few years: Less than 1/3 of the 1.6 Mio registered members actively contribute to the project (450,000 members). Furthermore, only a small group of 16% (270,000) or respectively 6% (100,000) of the contributors performed more than 10 edits or 10 changesets. A few months ago, Frederik Ramm posted an idea on the German OpenStreetMap mailing list about a new (stochastic) approach to OSM data quality assurance. You can find his original German post here. His idea was to create a way to allow users to “like” or “dislike” a specific region on the OSM map, a function that other popular websites such as YouTube or Facebook implemented to allow users to provide feedback to videos or status updates. 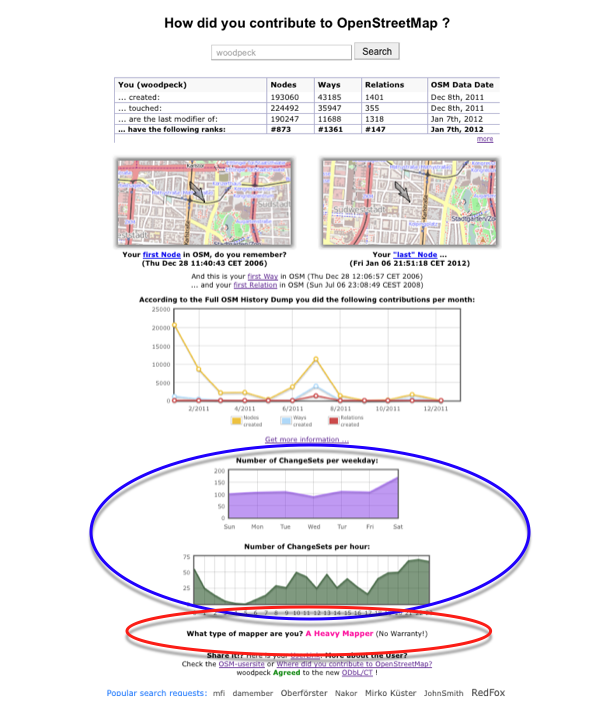 For OSM this particular function could give some indicators or trends about the OSM map data. I really liked his idea and in collaboration with Frederik I created an Open Source OpenLayers plugin. For all new readers: OpenLayers is an Open Source library which can implement a dynamic (OSM) map into more or less any webpage. One of our goals was to make the integration of the ILikeOSM plugin as easy as adding a tile server to your OpenLayers map. What type of Mapper are You? Last weekend Frederik and Richard asked me if I could give some additional information on the „How did you contribute to OpenStreetMap?“ webpage. So here we go. Below the prior, familiar chart which shows the contributions per month, you will find two new charts. The first one shows the number of changesets per weekday and the second one the number of changesets per hour. The German OpenStreetMap project webpage has been online for three years now. During these years several small updates have been made to the page. But it is about time to create a complete new webpage with a “state of the art” layout and style. Jonas created the first drafts of a possible new design of the site a while ago. Unfortunately he hasn’t had enough time to finish his work, but luckily Fabian and Pascal came up with a new webpage. Both of them considered Jonas first draft during the development and expanded it with their own ideas.